In honor of Black History Month, Allstate Insurance Co. launchedÂ “Worth Telling,”Â a national digital, social media, and radio campaign, spotlighting the accomplishments of 10 African Americans who are paving the way for others in the fields of art, education, health, science, music, and entrepreneurship. “This campaign celebrates the important contributions of African Americans across a broad spectrum of disciplines who are making a positive impact on society and inspiring others,” said Georgina Flores, vice president of marketing for Allstate. Through a series of Â incredibly inspiring videos, Allstate recognizes the individuals whose drive and passion has led them to become influential in their respective fields. 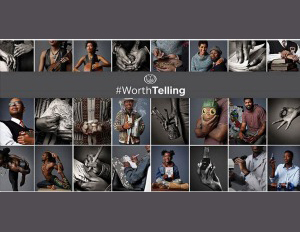 These stories will be included on the brand’s official YouTubeÂ®, InstagramÂ® and FacebookÂ® channels in February, using #WorthTelling. Individual stories from the campaign will also run online and in national radio advertising throughout the month. Watch the 2016 Worth Telling series below and subscribe to Allstate’s You Tube channel for new stories released each week throughout the month. A seven-year-old dreamer and idealist, McGriff started a comic series “The Adventures of Moxie McGriff” as a way to boost her confidence in her skin tone and hair. Self-love is Natalie McGriff’s super power. The amazing way she uses it, is Worth Telling. Listen as she talks about what makes her authentic.